Blogger hasn’t had a major update in years and has lost much of it’s ground to the likes of WordPress, Tumblr and arguably even Twitter and now to combat those losses and to bring the program inline with Google’s new user interface protocols the blogging software has announced several much needed improvements. According to Google not only is the UI prettier to look at, they have completely rewritten the editing and management experience from scratch, making it faster and more efficient, while writers will find more features for their blogging needs. The biggest improvement for writers is the ability to create or edit posts with just one click at the top of the screen, while the post editor has been “expanded and simplified” to provide a larger canvas for drafting and previewing work. Also included with the major release update is the ability to better track site visitor numbers and comment analytics. 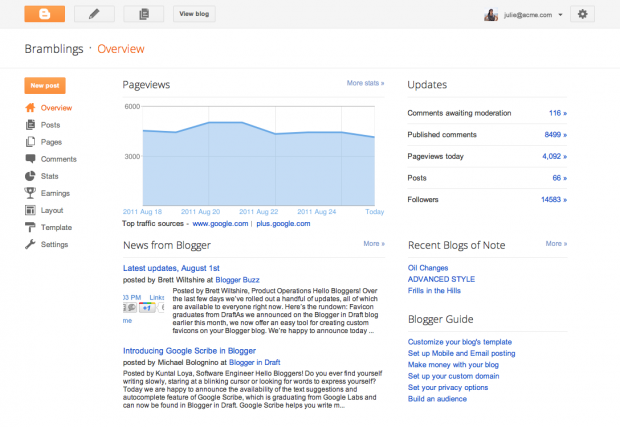 Called the “Overview” section users can see how people are reacting to their blog posts with simple to read graphs that show traffic numbers, comment activity and follower counts. Google has also added links to helpful articles for bloggers, a feed for Blogger updates and a showcase of interesting blogs. The new layout started arriving for Blogger users on Wednesday with a popup box appearing inside the users dashboard, allowing Blogger account holders to choose if they want to upgrade immediately which automatically changes their UI to the new setup.